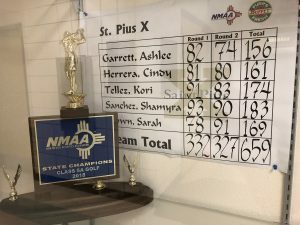 “To be a state champion, to have something tragic happen in your life and to fight back and try and retain what you had before..it’s an inspirational story,” is how St. Pius X golf coach Chris Moya explains the comeback of golfer Ashlee Garrett. Earlier this year, recent St. Pius X graduate Ashlee Garrett was involved in a near tragic car accident on the way to school. She suffered a fractured vertebrae along with a broken ankle. The vehicle she was in was destroyed, but her golfing career was not. Garrett was back to playing just weeks after the accident and this spring she helped her team win a state title, the program’s first ever. Garrett shot a final round 74 and finished tied for second individually. “Getting to win with my team was one of the greatest experiences because we’d been wanting to win for so long and to end it that way was perfect,” said Garrett. Garrett will tee it up at the New Mexico-West Texas Amateur Championship this week. She will golf for Long Island University Brooklyn in the fall.